Our Products. 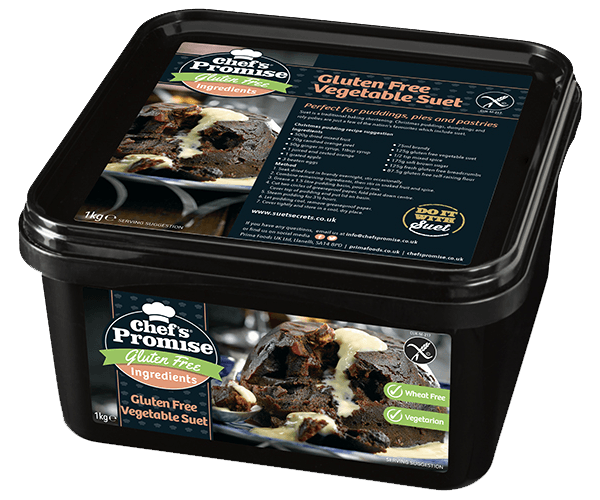 Chef's Promise, The Home of Gluten-Free Baking Mixes. 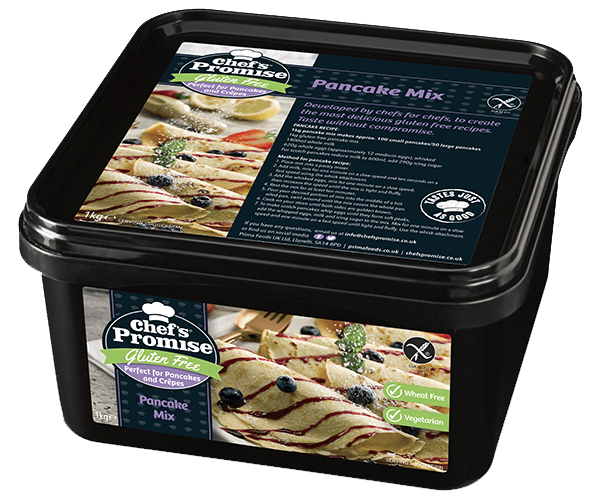 Chef’s Promise is designed to perfectly meet the needs of people looking for great tasting, gluten free products that give the same results time and time again. Since most of our products are mixes you can add your own twist, the opportunities to experiment are endless. 1KG of mix makes approx. 2 x 8 inch tins of sponge cake or approx. 36 cupcakes. 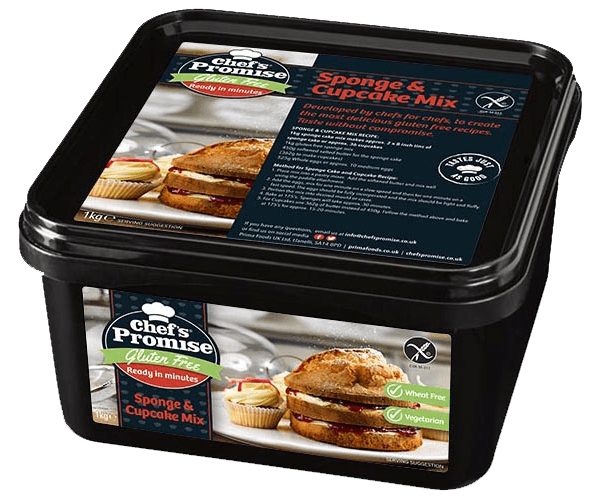 Use this mix to make cupcakes or sponge cakes. Perfect with jam and buttercream, or make it your own by adding your choice of sweet treats. Price: £7.99 per unit including delivery. 1KG of mix makes approx. 12 individual pies or 18 individual quiches. 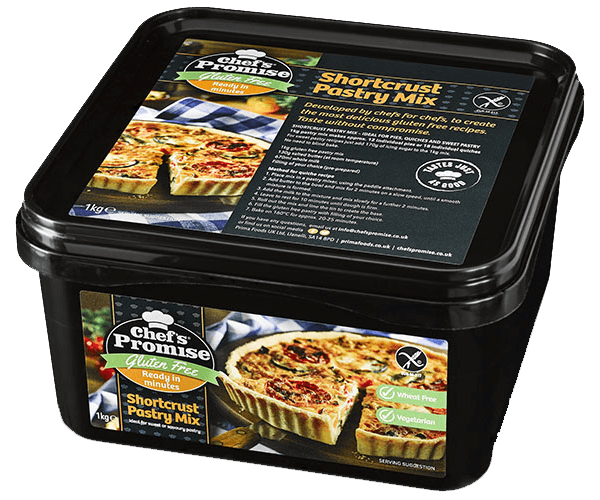 Our pastry mix is perfect for quiches or pies alike; this pastry mix makes a smooth and crisp shortcrust pastry. The mixture is super versatile: just add icing sugar to the mix to sweeten it – making it ideal for sweet pies and tarts. Create a Ruff Puff pastry mix and you can even make a delicious gluten free beef wellington. 1KG of mix makes approx. 30 dessert portions. The quickest of the lot – just open and sprinkle over a fruit filling. 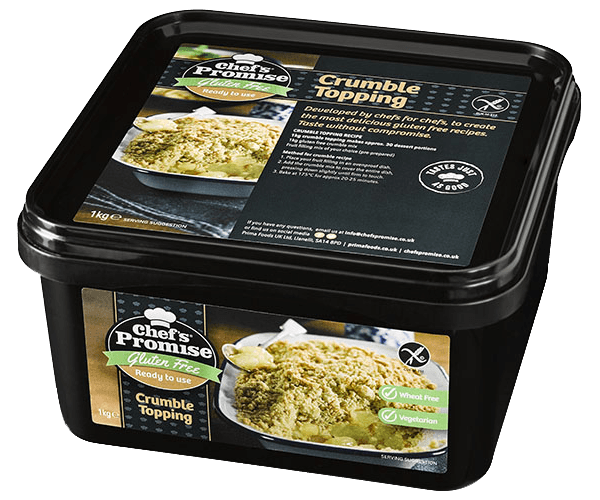 The ease of this topping and the reusable tub makes it perfect for individual crumbles.It’s crunch and sweet taste is just like the real deal. 1KG of mix makes approx. 92 x 25g stuffing balls. Just add water! 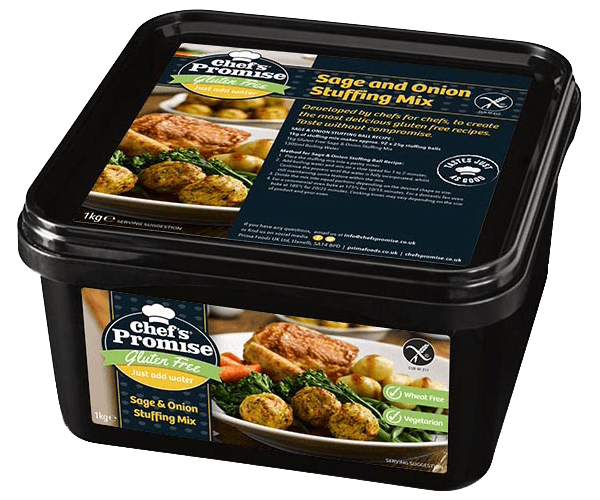 Our stuffing mix is a classic flavour combination of sage and onion. This versatile mix is a wonderful accompaniment to any dish and will bring your Sunday lunch to life. 1KG of mix makes approx. 60 small dumplings. Just add water! 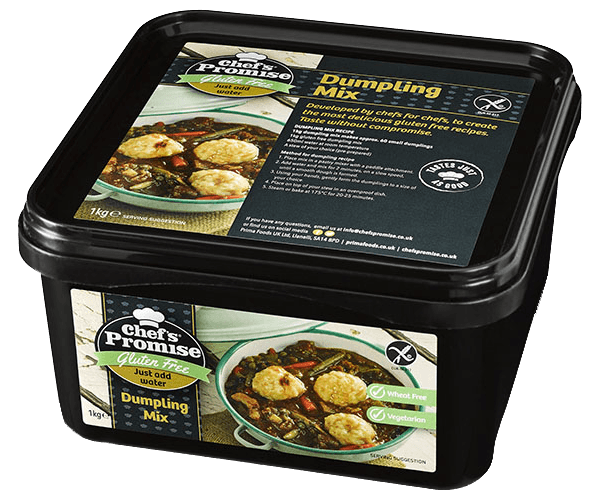 Our dumpling mix makes fluffy, plain dumplings, although you can add herbs and spices as you please to make them a perfect accompaniment for any dish. You can add them to traditional savoury meals, or put a modern twist on a classic by adding fruit, chocolate or nuts for a sweet dish. 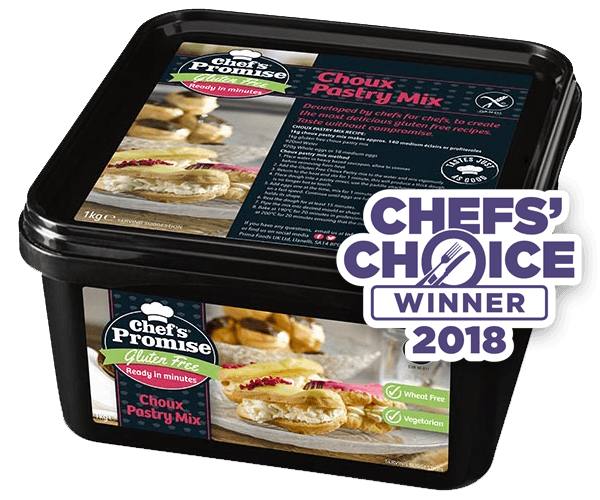 Whether you’re making profiteroles or eclairs these award winning choux buns will stand out – fill them with cream and cover in chocolate to create a show stopping dessert. Fancy something different? Why not create a savoury sensation by adding cream cheese, salmon and chives to your pastry creation. Choux pastry is tricky to make, and this mix is recommended for experienced bakers. 1KG of mix makes approx. 20 large chocolate brownies or 15 chocolate fondants. Our most indulgent mix is made with real Belgian chocolate. Make melt in the middle chocolate fondants, or gooey brownie slices. These rich and indulgent treats are perfect for desserts or an afternoon tea. Price: £9.99 per unit including delivery. 1KG of mix makes approx. 100 small/50 large pancakes. Use this mix to make light and thin crêpes, or fluffy scotch pancakes. An easy mix with perfect results every time. Serve with your favourite toppings, sweet or savoury these pancakes are bound to be a hit. 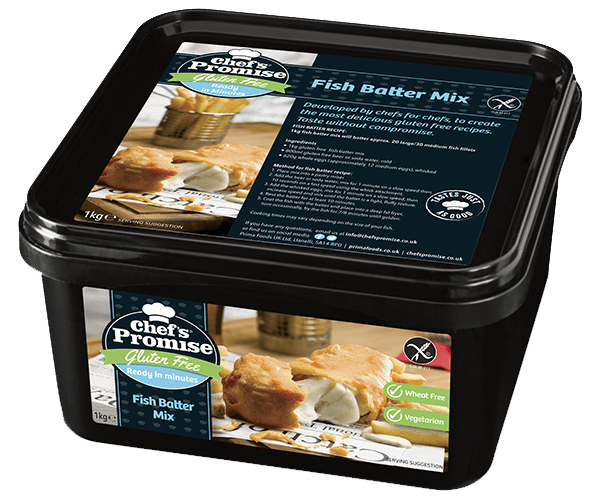 Our batter mix makes a light and flavourful coating for fish. This crispy batter can be made with soda water or gluten free beer and will make your fish and chips stand out in the crowd. 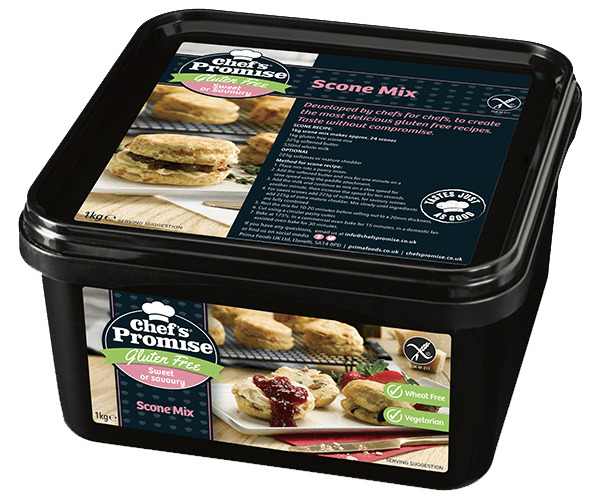 Create sweet sultana or savoury cheese scones with our scone mix. A wonderful addition to your afternoon tea, these scones are simple to make, bursting with flavour and great served warm. Suet can be used in a huge variety of dishes, sweet or savoury; the traditional ingredient has been used as a baking shortening for many years. Suet crust pies, pond puddings, mincemeat, Christmas puddings, dumplings and roly-polies are just a few of the nation’s favourite dishes which include suet. When manufactured all of our products have 12 months shelf life. We guaruntee a minimum of 3 months shelf life on the date of product delivery. After products have been opened they should be used within 3 months. Free UK Mainland delivery on all orders, please refer to Terms and Conditions and Shipping Policy for more information. We operate a 3-5 working day delivery scheme as standard. Place mix into a pastry mixer. Add the softened butter and mix well using the paddle attachment. Add the eggs, mix for one minute on a slow speed and then for one minute on a fast speed. The eggs should be fully incorporated and the mix should be light and fluffy. Portion the mix into desired mould or case. Bake at 175*c. Sponges will take approx. 30 minutes. For Cupcakes use 362g of butter instead of 450g. Follow the method above and bake at 175*c for approx. 15-20 minutes. 1kg Pastry makes approx. 12 individual pies or 18 individual quiches. For sweet pastry recipes just add 170g of icing sugar to the 1KG mix. No need to blind bake. Add butter to the bowl and mix for 2 minutes o a slow speed, until a smooth mixture is formed. Add the milk to the mixture and mix slowly for a further two minutes. Leave to rest for 10 minutes until dough is firm. Roll out the mix and line the tin to create the base. Fill the gluten free pastry with filling of your choice. Bake on 160*c for approx. 20-25 minutes. Ingredients: Flour Blend (Rice Flour, Maize Starch, Maize Flour, Tapioca Starch, Emulsifier: E464), Vegetable Oils (Palm, Sunflower), Rice Flour, Soya Flour, Salt, Raising Agents E450(i), Sodium Hydrogen Carbonate E500(ii). For allergens see ingredients in bold. Place your fruit filling in an ovenproof dish. Add the cover mix cover the entire dish, pressing down slightly until firm to touch. Bake at 175*C for approx. 20-25 minutes. Ingredients: Rice Flour, Demerara Sugar, Vegetable Suet (Palm Oil, Sunflower Oil, Rice Flour), Maize Starch, Dextrose, Maize Flour, Tapioca Flour, Emulsifier: E464, Salt. Add water and mix on a slow speed for 1 to 2 minutes. Continue the process until the water is fully incorporated, whilst still maintaining some texture within the mix. Divide the mix into equal portions depending on the desired shape or size. For a commercial oven bake at 175*c for 10/15 minutes. For a domestic fan oven bake at 185*c for 20/25 minutes. Cooking times may vary depending on the size of your product and oven. Ingredient: MaizeFlour, Dried Kibble Onions (sulphites),Vegetable Suet (Palm Oil, Sunflower Oil, Rice Flour), Onion Powder (sulphites), Salt, Dried Parsley,Rubbed Sage, Baking Powder (E450(i), Sodium Hydrogen Carbonate E500(i), SodiumHydrogen Carbonate E500 (ii), Rice Flour, Black Pepper. Allergy Advice: For Allergenssee ingredients in bold. Place mix in a pastry mixer with a paddle attachment. Add water and mix for 2 minutes, on a slow speed, until a smooth dough is formed. Using your hands, gently form the dumpling to a size of your choice. Place on top of stew in an ovenproof dish. Steam or bake at 175*c for 20-25 minutes. Ingredient: Flour Blend (Rice Flour, Maize Starch, Maize Flour, Tapioca Starch), Vegetable Oils (Palm, Sunflower), Raising Agents E450(i), Sodium Hydrogen Carbonate E500(ii), Salt. Place mix into a pastry mixer. Add the melted butter, use a paddle attachment and mix for one minute on a slow speed, then continue using a fast speed for 10 seconds. Add the eggs, mix for one minute on a slow speed, then continue using a fast speed until everything is combined. For fondants butter ramekins and line with a dusting of cocoa powder, then add the mix. For brownies line a flat baking tray with baking parchment, then add the mix. Bake at 190ºc. In a commercial oven bake brownies and fondants for 10 minutes. In a domestic fan assisted oven, bake brownies for 25/30 minutes, and fondants for 20 minutes. Ingredients: Chocolate Powder (48%) (Milk) , (Sugar, Cocoa Mass, Reduced Fat Cocoa Powder, Natural Vanilla Flavouring), Sugar, Rice Flour, Cocoa Powder, Maize Starch, Maize Flour, Tapioca Starch, Methocel E464. Add the beer or soda water, mix for 1 minute on a slow speed then 10 seconds on a fast speed using the whisk attachment. Add the whisked eggs, mix for 1 minute on a slow speed, then increase speed and mix until the batter is a light, fluffy texture. Rest the batter for at least 10 minutes. Coat the fish with the batter and place into a deep fat fryer, turn occasionally, fry the fish for 7/8 minutes until golden. Add milk, mix for one minute on a slow speed and ten seconds on a fast speed using the whisk attachment. Add the whisked eggs, mix for one minute on a slow speed, then increase the speed until the mix is light and fluffy. Rest the mix for at least ten minutes. Pour your desired portion of mix into the middle of a hot oiled pan, swirl around until the mix covers the whole pan. Cook on your stove until both sides are golden brown. To make scotch pancakes whip eggs until they form soft peaks, add the whipped eggs, milk and icing sugar to the mix. Mix for one minute on a slow speed and one minute on a fast speed until light and fluffy. Use the whisk attachment. Add the softened butter and mix for one minute on a slow speed using the paddle attachment. Add the milk and continue to mix on a slow speed for another minute, then increase the speed for ten seconds. For sweet scones add 225g of sultanas, for savoury scones add 225g of extra mature cheddar. Mix slowly until ingredients are fully combined. Rest the mix for 10-20 minutes before rolling out to a 20mm thickness. Cut using a circular pastry cutter. Bake at 175ºc. In a commercial oven bake for 15 minutes, in a domestic fan assisted oven bake for 30 minutes. Ingredients: Maize Starch, Potato Starch, Soya Flour, Maize Flour, Baking Powder (E450(i), Sodium Hydrogen Carbonate E500(ii), Rice Flour), Tapioca Starch, Emulsifier E471, Salt, Xanthan Gum. Place water in heavy based saucepan, allow to simmer before removing from heat. Add the Gluten Free Choux Pastry mix to the water and mix vigorously. Return to the heat and stir for 1 minute, this will produce a thick dough. Place dough into a pastry mixer, use the paddle attachment and mix until dough is no longer hot to touch. Add eggs one at the time, mix for 1 minute on a slow speed, then for another minute on a fast speed. Continue until eggs are fully mixed and the dough is loose but still holds its shape. Rest the dough for at least 15 minutes. Pipe the mix in to desired mould or shape. Bake at 190oc for 20 mins in Professional combi oven. For domestic fan oven bake at 200oc for 20 minutes ensuring that the oven is up to temperature before baking. Ingredients: Non-hydrogenated Vegetable Fat 85% (Palm &Sunflower), Rice Flour. 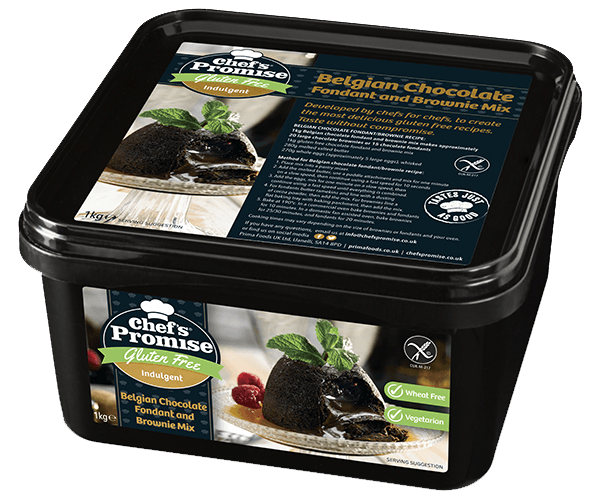 Our meal component range includes gluten free frozen dumplings, gluten free frozen stuffing balls and gluten free frozen pastry pucks & lids. For more information regarding these products please visit www.primafoods.co.uk.